Rangers manager refuses to get into a war of words with the outspoken Hibernian boss. Rangers manager Ally McCoist laughed off Alan Stubbs’ referee comments ahead of Monday evening’s clash with Hibs. The Edinburgh club’s boss has urged referee Calum Murray not to be swayed by the Ibrox crowd when the side’s meet in the Championship. 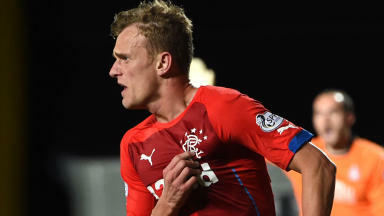 Stubbs still believes the controversial sending off decision in the Petrofac Training Cup clash at Ibrox last month changed the outcome of the match. Hibs were dominating when Danny Handling was shown a contentious red-carded by John Beaton for a challenge on David Templeton in the 80th minute. Rangers went on to win the tie 2-1 in extra-time. But McCoist refused to get dragged into a war of words and jokingly invited his opposite number to referee the match himself. “If Stubbsy wants to pick the referee I don’t have a problem with that, if he wants to referee the game himself I don’t have a problem with that actually,” he said. “I’m looking forward to it, I think it’s going to be a tough game. 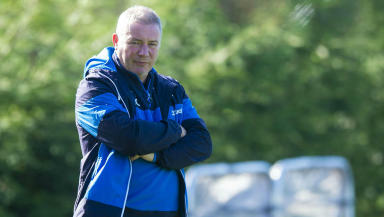 But when responding to Stubbs’ comments about refereeing consistency, McCoist felt there was one decision he’d missed out. “It’s an interesting one, the only one he failed to mention was I thought we could have had a corner on Tuesday night against Falkirk that the referee failed to spot. “But Stubbsy’s been commenting on other games, which is fine, but we’re not getting carried away. The referee’s as experienced as they come. He’s a very good and competent referee and we’re very happy with that.